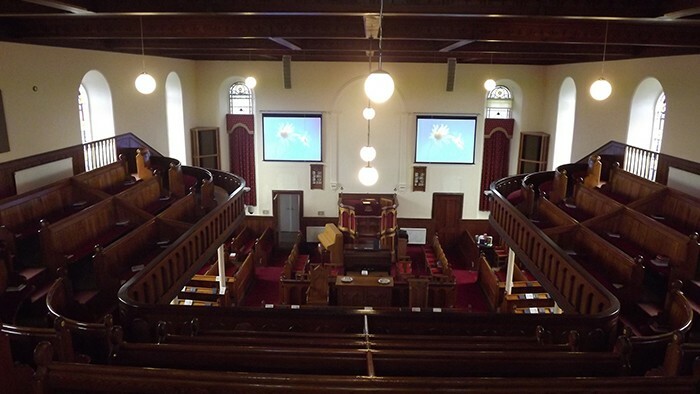 One of the most stylish, discreet and popular PA’s in the House of Worship sector has been installed by Rea Sound in the Donaghcloney Presbyterian Church, Northern Ireland. The Martin Audio OmniLine® micro array has been integrated in a design encompassing two separate PA hangs, with eight modules in each, along with Martin Audio’s equally unobtrusive AQ5 for under-balcony fills — all powered by a single Martin Audio MA2.8Q power amp. This process began when the church’s technical representative, Wayne Buttery, visited the Rea Sound stand at the Church Resource Show in Belfast in February 2012 — and six months later made contact again with Martin Audio’s Irish distributors. Rea Sound duly won the contract to replace the existing PA system on the strength of their knowledge, product and adaptability. The church’s previous system, installed in the early 1980’s, had reached end of life and the sound quality had deteriorated dramatically. Seeking a solution that would take them far into the future, they also simultaneously commissioned a complete visual display system, with PTZ cameras, projectors and screens. And that included delivering consistent audio coverage with unprecedented accuracy, requiring only one amplifier channel per array. By utilising a complement of unique drivers and mechanical alignment techniques, simple EQ and Limiting is the only processing required, while the powerful software application provides accurate inter-cabinet and array angles, in order to optimise coverage over a predefined area. In other words, OmniLine’s vertical beam-forming is achieved by physically articulating individual array modules to curve the array, at the same time being designed to deliver constant horizontal directivity from low mid, right up to extreme high frequencies. In fact the OmniLine optimisation was implemented by Rea Sound’s own in-house engineer, whose software calculations ensured even coverage throughout the Church. Whilst the main body of the church could be covered with the Omniline hangs, under the wrap-around balcony AQ5 infills were required to keep levels and intelligibility the same. Both the church’s technical team and clergy are delighted with the quality of the new system and the improvement in intelligibility which has greatly improved the experience for congregations numbering up to a capacity 450.